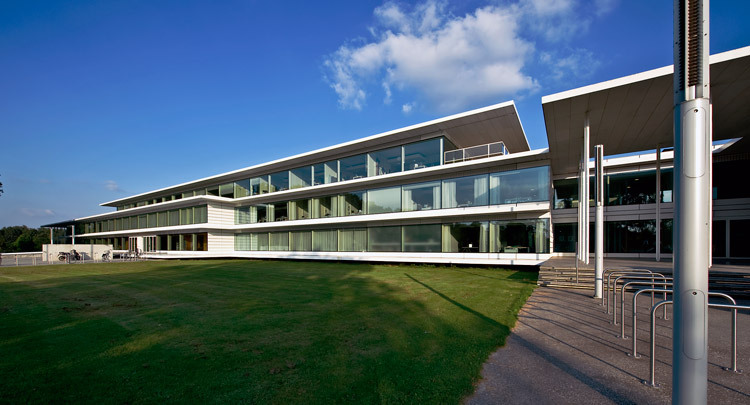 Tynaarlo municipal hall registers as a white strip of steel and glass in the magnificent landscape between the three village centres it serves. The elongated two-storey volume is mainly informed by white roof edges and areas of floor jutting far into space. These white planes have all-glass facades between them. At the rear, opposite the main entrance, the council chamber is an all-glass volume protruding from the main mass. A third storey on the roof contains offices for council members and a canteen. At the southernmost extremity, a police post stands freely beneath the roof of the main building. Inside, wooden partitions and wainscoting abound.